There are certain albums I get attached to very quickly and then as the week rolls on I am distracted by the bright shiny songs on another album. Once in a while, there are albums that, no matter what the weather is outside or what emotional state I’m in, I will always come back to celebrate. 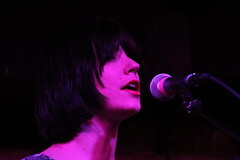 Sharon Van Etten‘s 2010 release, “Epic”, is an album I hold close to my heart like a security blanket – or rather, an insecurity blanket when you take most of the lyrics into account. “One Day” is my second favorite song from that album, its only competition being “Save Yourself”, which almost made me cry (I’m a big cry baby) when I watched her performance on NPR’s Tiny Desktop Concert. I literally watched the video on repeat for a good half day. This entry was posted in Hear No Evil and tagged Epic, music, Sharon Van Etten by Mia. Bookmark the permalink.